Today is my daughter’s 20th birthday and I told her I would make whatever she wanted. Because she still eats the S.A.D. (Standard American Diet), I was scared at what she would come up with. But much to my surprise, she chose the famous Smoked Mozzarella Pasta Salad from the Whole Foods deli that she loves to get, but is rather pricey at $9.99 a pound. The ingredients are listed on the label attached to the container when you purchase it from the deli, so it was just a matter of guessing and tweaking the measurements of everything. I’ve eaten my fair share of it back in the day before cleaning up my diet, so I know what it is supposed to taste like and I must say that it tastes pretty darn close. It has a creamy, but tangy sauce tossed with diced pieces of smoked mozzarella, spinach, red bell peppers and topped with optional shredded Parmesan cheese. 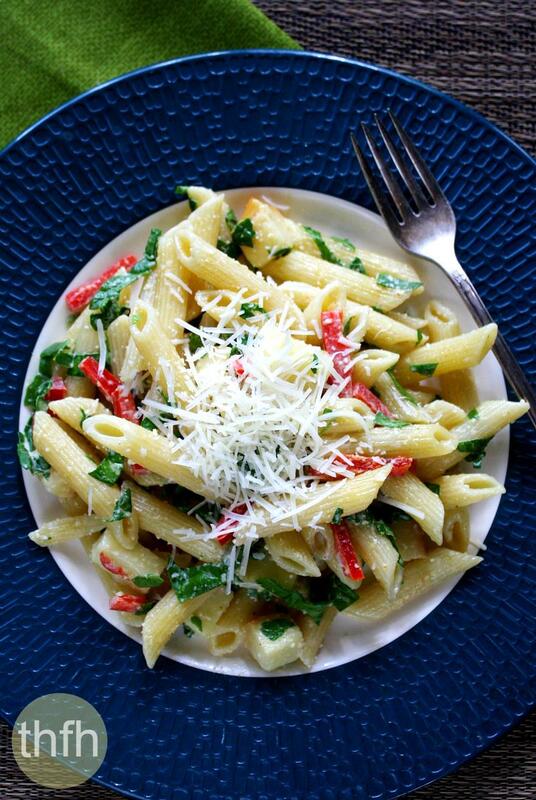 Just make sure you use your favorite gluten-free penne if you need the dish to be 100% gluten-free. And, not only do you have control over the ingredients (and cost), but you can use organic mayonnaise and not “canola oil mayonnaise” which is in the Whole Foods deli ingredients. I’ve asked several employees multiple times if the canola oil they used was GMO-free and never could get an answer. Tip #1: I used the shredded Parmesan cheese instead of the grated/powder-type. Tip #2: The reason you want to make sure the pasta is chilled or at room temperature before mixing everything in is because if it is hot, the mozzarella cheese chunks will melt. I put my pasta in the refrigerator while I prepared the sauce and diced the other ingredients and by the time I was finished it was ready to go. 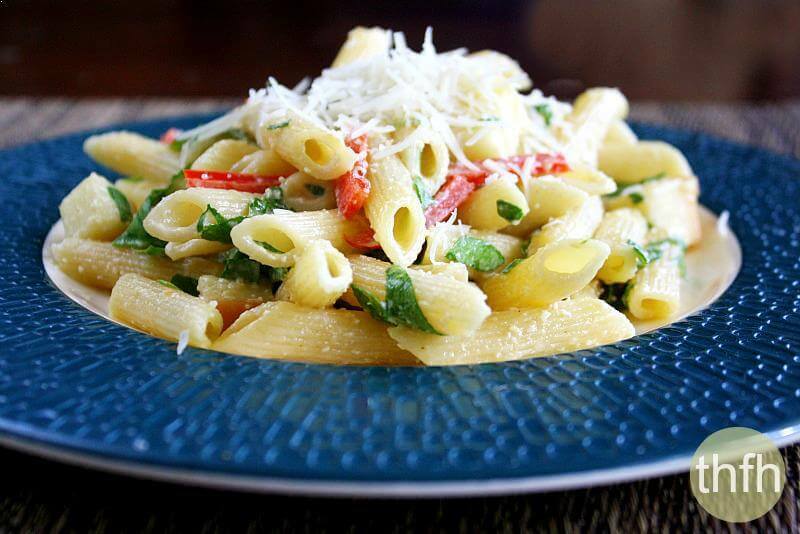 Tip #3: You can make this dish gluten-free by using gluten-free pasta. Step 1 Boil and prepare pasta according to package directions. Chill either in refrigerator or let it come to room temperature; set aside. Dice mozzarella cheese, baby spinach and red peppers; set aside. Put mayonnaise, Parmesan cheese apple cider vinegar, garlic, Himalayan pink salt, and cayenne pepper in a food processor and process until smooth. 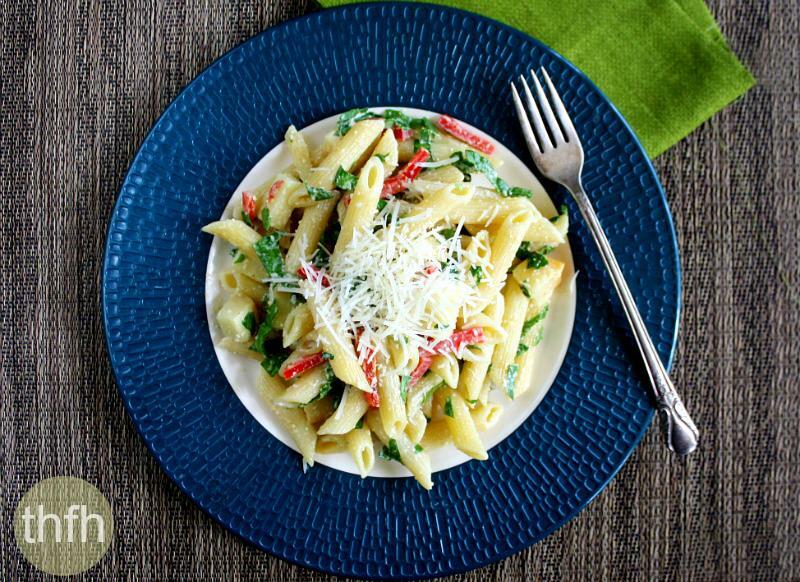 In a large mixing bowl, combine the cooked pasta, diced mozzarella, baby spinach, red peppers and sauce. Sprinkle additional Parmesan cheese on top and serve. This recipe will make approximately 4 servings. The photographs for "Smoked Mozzarella Pasta Salad" by Karielyn Tillman of The Healthy Family and Home are licensed under a Creative Commons Attribution-NonCommercial 4.0 International License and cannot be used without my written permission. The best pasta salad ever! Hi there Sabrina! I’m so glad to hear that you enjoyed it!